Sesame Street Dyed-Coconut Cake | Not At My House! This is the first cake I ever made as a mom, for my firstborn’s first birthday. It was inspired by the Women’s Day Star-Spangled Quilt Cake, and also by the Baker’s Coconut Cut-Up Cakes of my childhood (thanks, mom!). I used vanilla cake mix and canned frosting for the cake base. Then, following the quilt cake recipe’s “cut out stars” step for adding confectioner’s sugar to the frosting to make it thicker and dough-like, I formed the letters and characters’ pupils, mouths, and Elmo’s nose. Put some gel food coloring and a generous handful of sweetened, shredded coconut into a Ziploc bag and smooshed it around to dye the coconut blue for Cookie Monster and Red for Elmo. Using a toothpick, I lightly traced a grid into the plain white frosting and then carefully applied the dyed-coconut fur to the lower left and right corners. Next, I practically shoveled the remaining un-dyed coconut on to the remaining areas. For the characters’ eyeballs, I snipped off the top (or bottom) 1/3 of a standard marshmallow and flattened it with a rolling pin. I believe I used a small bottle of store-bought orange icing to pipe the wiggly lines around the A. Finally, I can’t remember whether I rewarded myself for all this hard work with a bite of the Chips Ahoy in Cookie Monster’s mouth, or took the more sanitary approach of breaking off a corner, but that was the last hurrah for this exhausting, but gratifying, debut. 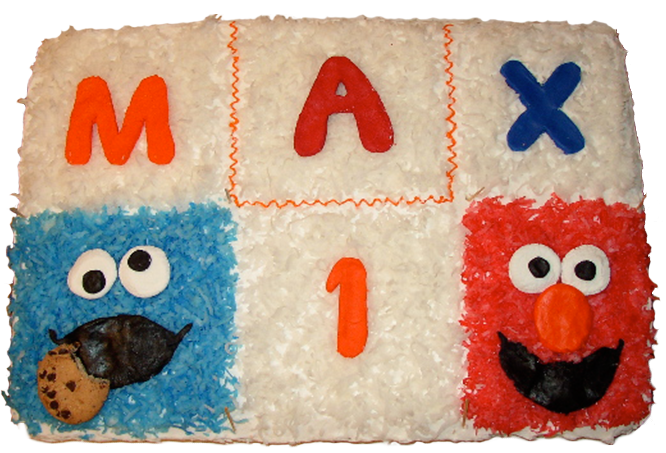 This entry was posted in Cakes and tagged birthday cake, coconut, cookie monster, elmo, sesame street, shredded coconut by jessicazr. Bookmark the permalink.